Imagine a quiet life of meditation, conversation, poetry, painting, calligraphy and music, all within a walled garden with rocks, water, trees, plants, sculptures and surrounding buildings. In ancient times only the elite literati could dream of such a life, and to most people today it is no more than pictures from a book. Surprisingly, however, people in Taiwan can now get a taste of this refined lifestyle at Nan Yuan, a classical Chinese garden located in the lush mountains of Hsinchu. Nan Yuan, or 'South Garden,' is a well-kept secret. Built between 1983 and 1985 and intended for private use, the garden was only opened to the public in the fall of 2008. The garden was mysterious from the start, with even locals knowing very little about it. We were very curious when helicopters flew into the mountains in 1983 and there seemed to be some construction going on. There was even a rumor that the hundreds of workers there were building President Chiang Ching-kuo's tomb, a local inhabitant who declined to give his name said. Visitors to Nan Yuan have also been shrouded in mystery, but are said to include former British Prime Minister Margaret Thatcher, former Soviet leader Mikhail Gorbachev, and New York Times publisher Arthur Sulzberger, Jr. It was not politics or military secrets that led to the construction of Nan Yuan, however. °Originally, it was a gift for Wang Tih-wu, founder of the United Daily News and Economic Daily News, from his two sons,' said Carrent Wang, deputy manager of the Marketing Division of The One Images Ltd., the company now responsible for the management of Nan Yuan. According to Wang, Nan Yuan is one of the best works of Han Pao-teh, the well-known Harvard-educated architect who established Tainan National University of the Arts and served as the director of the National Culture and Arts Foundation. After the Wang family commissioned him for the project, during a trip to the 27-hectare site Han was excited to find the landscape very suitable for building a classical Chinese garden. The family gave him free rein in designing the garden. For the garden Han revived ancient design philosophy. First, he adapted the most representative plan of a classical garden: a series of wood pavilions surrounding a lake and an arched bridge in the center of the garden, with a main hall overlooking the whole thing. Traditional construction techniques were employed, with no nails used in the buildings. Nan Yuan also preserves the traditional employment of symbols in Chinese gardens. A vase-shaped doorway, for instance, represents 'peace' because the words for 'vase' and °peace' in Chinese are homonyms. Carvings on the eaves and pillars display auspicious animals or patterns mentioned in folklore and legend. By using red brick and roof tiles, Han infused a southern Fujian flavor in Nan Yuan, in contrast to the white walls and black roof tiles of Suzhou gardens. Carrent Wang said when the UDN Group wanted more people to be able to share in the garden's beauty, they commissioned The One to manage Nan Yuan in 2008. 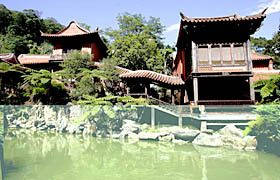 The design company refers to Nan Yuan as 'the land of retreat and wellness'. It now provides guided tours of the garden, lodging, dining and a comprehensive exhibition of local designers works. 'A classical garden is more than just wooden houses, and artificial mountains and ponds. It embodies a refined and relaxing lifestyle, which modern people have little knowledge of but long to experience,' Wang said. To bring life to the architecture, it is important to revive the lifestyle. 'The aesthetics of the architecture depend on how people use it. 'Wang said, 'and that is why we invite calligraphers and handicraft artists to work in some of the pavilions and teach visitors about their art. Instead of rushing from site to site and just passively listening to a guide, visitors enjoy themselves playing old-style games, making wooden toys, or learning about tea tasting in the waterfront pavilion. This article and others of interest are available online at Taiwan Today.